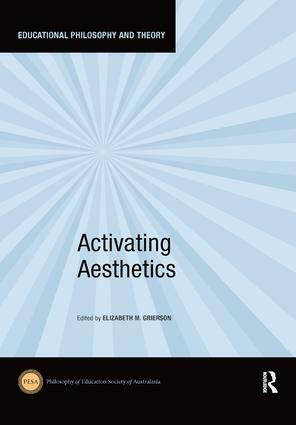 Activating Aesthetics addresses questions of aesthetics in various fields of education, with the aim of investigating a way of revealing how aesthetics may activate an engaged, responsive and poetic pedagogy. The writers in this collection enliven different ways of thinking about aesthetics, educating through aesthetics and questioning aesthetics. They approach aesthetics through the lenses of art practice and art history, painting and literature, film and popular culture, the built environment and pedagogy, music making and reception, and feminist subjectivity and philosophy. Beyond instrumentalism, each chapter approaches questions of aesthetics by dismantling subject–object separations of analytical aesthetics and opening the potential of aesthetics to work as an activating force in education. The premise is that education, driven by means–end instrumentalism, may be activated another way via aesthetic encounters premised in difference. To build this argument, the authors engage works of Adorno, Benjamin, Bourdieu, Deleuze, Guattari, Heidegger, Hölderlin, Hokusai, Irigaray, Nietzsche, Sterne and Stiegler. The juxtaposition of these diverse theorists, philosophers, artists and writers makes for a rich tapestry of different perspectives on processes of learning, knowing and being. Aesthetics in activation discloses new ways of thinking about poetic and engaged pedagogy. Through these different perspectives, the whole collection works towards an educational philosophy of aesthetics. The chapters in this book were originally published as articles in the Educational Philosophy and Theory journal. Elizabeth M. Grierson is Professor at RMIT University, Melbourne, Australia. An Australian lawyer, and a barrister in New Zealand (as Gresson), with a Ph.D. in Education and a Juris Doctor Distinction, she publishes in philosophy of education, aesthetics, law and justice.